Probability maths says that given infinity, a random character generator (producing upper and lower case letters, spaces and punctuation marks) will reproduce the Complete Works of Shakespeare. Think monkeys and typewriters, if you like. You can kind of see what they mean, and there’s probably not much point arguing with a probability mathematician (though there are valid questions about the abstract concept of infinity) – but it just seems wrong, doesn’t it? The first sentence or two, maybe – but the whole thing? Maybe some things will never happen by chance, even in infinty. Then there’s the origin of DNA. Scientists say it can be explained by random chemical events occurring over a very long time. There are several different theories as to how this might have happened, but none of them sounds remotely plausible. As with the randomly reproduced Shakespeare, it just seems impossible. I know it sounds like I’m on the slippery slope from intelligent design to creationism, but I’m not. I’m suggesting that the crucial element in both cases is meaning. Scene I: Westminster Abbey. Dead March. Enter the funeral of King Henry V, attended on by Dukes of Bedford, Regent of France, Protector; and Exeter, Earl of Warwick, the Bishop of Winchester, heralds, etc. Bedford: Hung be the heavens with black, yield day to night! I’m yawning already, but that’s not the point. The works of Shakespeare, including that opening of the first play, exist because they have meaning. That meaning comes from human consciousness (and its medium, language) . The unique sequence of six million characters comprising that product of meaning could never be reproduced by chance, I’d suggest. Wikipedia says that DNA is a molecule that carries the genetic instructions used in the growth, development, functioning and reproduction of all known living organisms. Most DNA molecules consist of two strands coiled around each other to form a double helix. Both strands store the same biological information, which is replicated when the two strands separate. Does that sound like something that came about by chemicals randomly bumping into each other? Perhaps DNA came into existence because the universe (or multiverse if you like) has meaning, perhaps deriving from universal consciousness. Again, I’d suggest that meaning is never the product of random processes. It must, of course, be admitted that random genetic mutation fueled the natural selection that led from the first living organisms to humans capable of pondering the meaning of meaning. Nevertheless, randomness and meaning are worlds apart. Or perhaps, rather, they’re part of a hierarchy, with randomness subject to probability, and probability subject to meaning. Try as it may, maths and science can’t yet explain the origin of life, what consciousness is, or the ultimate nature of the universe. I’m a big fan of maths and science. I’d love science to have an explanation for everything; but perhaps some things are ineffable. Perhaps maths, for all its fundamental beauty, is the scaffolding rather than the be-all and end-all. I thought my post title was original – but, of course, it’s not. 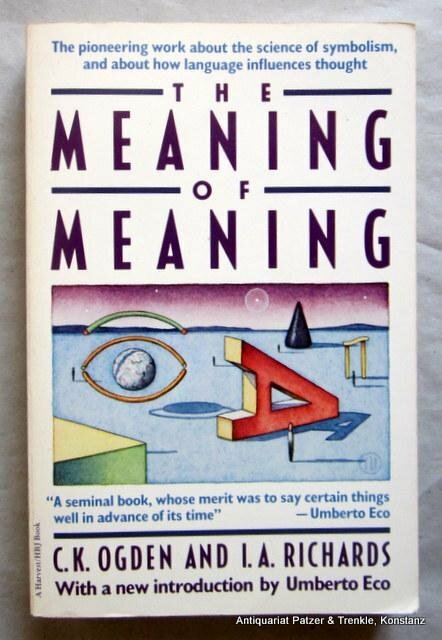 The Meaning of Meaning: A Study of the Influence of Language upon Thought and of the Science of Symbolism by Charles Ogden and Ivor Richards has been in print continuously since 1923. The most recent publication is the critical edition prepared by Terrence Gordon as volume 3 of the 5-volume set C. K. Ogden & Linguistics (London: Routledge/Thoemmes Press, 1995). Wikipedia says that the book proposes a contextual theory of signs: words and things are connected by signs that are the source of our power over the external world. The book has been used as a textbook in many fields including linguistics, philosophy, language, cognitive science, semantics and semiotics. Umberto Eco described it as ‘a seminal book, whose merit was to say certain things well in advance of its time’.